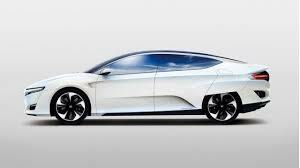 In 2013 Honda showed their highly aerodynamic FCev concept car. The production version has been revealed and is surprisingly close in feel to the ’13 car. The objectives with the FCev are for a vehicle to produce 100kW from its fuel-cell stack and carry four adults. The aerodynamically creased body shell reduces the cD in an overt way we have not seen for two decades. This promises 300 miles of range, which is not so bad if you recall that the Citroen CX GTi got by with a 280 mile range. If you drive an Aston Martin hard you can get considerably less. Among the changes to the 2013 concept car (above) are that the wheel arches are now fared in to a lesser extent, and reminiscent of said CX. The swoopy, arrowlike shape has been deformed to fit a more realistic package. While considerably less sleek, it is still a remarkably pure design which manages to look bold without being contrived. The ’13 concept car had a more pronounced inward rip forward of the rear axle and its black cladding around the sills has been toned down for production. There is also the addition of an extra styling crease over the rear wheel arch on the 2016 car; had the rear axle been narrower of track than the front (as Citroen used to do) they could have avoided this addition. Curiously, the side glass line has the same upward flicks at the front and back as can be found the current Citroen C5. 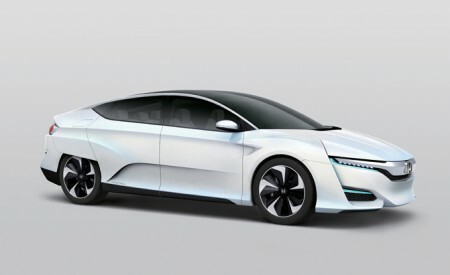 Here is a look at the side profile of the FCev. It has a conventional Accord-type shape but still retains a very purposeful and singular character. The fuel cell concept is also being explored by Toyota who announced details of the Mirai today. While there is the distinct lack of infrastructure available for fuel cell cars, this can be counterpointed by the difficulties that pertain to electric charging. The main claimed advantage is the dramatically reduced charging time. 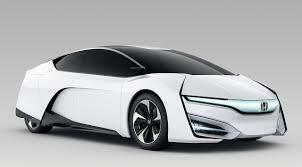 Honda say that it can take under a few minutes to re-tank the car with hydrogen while electrically powered vehicles can require several hours, depending on the level of charge needed. Toyota Mirai: not quite as attractive? We haven’t covered so much Honda news here at DTW but this vehicle shows a lot of promise, both in engineering terms and in the clarity of its aesthetics. I am particularly impressed with the skilful job done in translating the style of the 2013 car to the production model (which is effectively what the car shown yesterday is). As a side note, PSA have announced that the DS brand will become a standalone line of cars but have very clearly said that the identity of the cars will be led by “style”, “design” and “French flair” rather than engineering. In the light of this production-ready car from Honda where the styling reflects real aerodynamic characteristics, PSA’s arguments for DS seem rather thin. 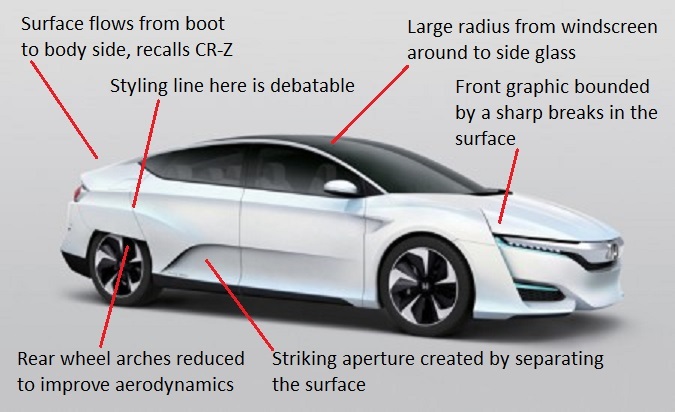 Odd (unless you could possibly believe that one manufacturer would copy another) is that the Honda and Toyota seem to agree on a vocabulary for the styling of fuel cell cars. Tall vertical intakes either side at the front and a swoop over the rear wing. This is certainly separated by several decades from the backyard artisan efforts of PSA. Hard to imagine a more vacuous reason for not bothering to engineer decent cars than PSA’s idea of using ‘French Flair’ instead. That concept should sell Citroe … sorry DSs just as well a ‘British Craftsmanship’ sold Rovers. I’d forgotten about Rover’s British craftsmanship. The Honda is very pleasing to look at. I don’t often get to say that. In counterpoint Toyota’s is very eccentric. It’s hard to believe Honda are placing this on sale but they have a good mainstream range to subsidise the startup phase, as VW had when upgrading Audi. Yes. Although I meant there were parts of the vocabulary that were similar, one manufacturer is much better spoken than the other. This one is definitely growing on me (but I quite like Hondas generally, including current line-up). Shame we won’t get to see it on our roads anytime soon. I fail to see how this can be very aero since the front is very busy no doubt due to the need for fuel cell stack cooling. This is why Toyota has the large vertical intakes which also must increase drag. David Pye wrote (correctly) that every design is a failure to the extent that the design is a mass of compromises. Besting that in mind, the car here is as aero as it can be *given* the need for cooling. You wouldn’t put that front on a ICE car but maybe this is what a car with this powertrain requires. Have you read David Pye? His books on design are very readable and will possibly change your outlook or articulate ideas you already had. The writing is very clear and elegant and utterly unlike the majority of design texts. Somewhat of a paradox since the car is striving for max efficiency but the powerplant requires it to increase drag! Hmm. It’s a compromise. It might only direct flow into the car and then send it out very quickly. I imagine it’s well vented.